Join the discussion on our forums! 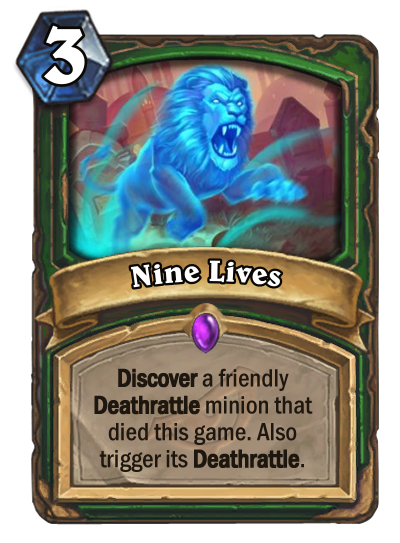 Come discuss Nine Lives over in our dedicated Nine Lives discussion topic. Discover a friendly Deathrattle minion that died this game. Also trigger its Deathrattle. Beware the night of the living pets! Stupid cards like this make me wonder when we'll get neutral polymorph, because it's otherwise uncounterable. This card is stronger than Hunter’s legendaries this set. Would this trigger Mecha'thun before it enters your hand? Or is it entering your hand resolved during the "Discover" phase? Shimmerfly value! Lol. I'm intersted in the crazy stuff Wild players will do with it. This is such a powerful effect that it's going to limit design space for all future deathrattle cards in standard. Not sure how I feel about hunter getting another goodie. At least deathknights are gone..
Ah, there's always to choice of trying something foolish with Hakkar, if there was a way to reduce his cost anyway. Tracking could do to lower the blood count for one's own deck. Maybe Flark can make it work, but we'd need to be lucky enough to not draw Hakkar.